How quickly you can develop size in your arm muscles depends on a couple factors, including your training history and genetics. But, you can make your training program effective by working out at an appropriate frequency and volume, by incorporating both compound and isolation exercises and keeping rest periods in between sets short. A comprehensive arm workout should focus on both the biceps and triceps muscles. Although you may think working out more often will invoke the biggest muscle development, it's actually more effective to train less frequently when you're trying to build size. 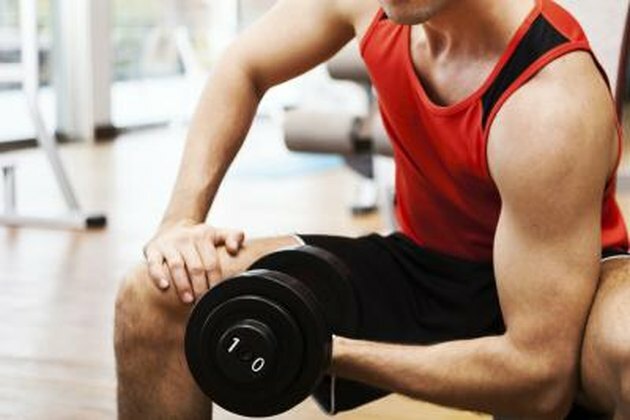 Your arm workouts are going to thoroughly break down and damage both your biceps and triceps. It's during your days off that they heal and grow. If they don't get enough time, their development is limited. Therefore, schedule your arm workouts twice a week and allow for two to three days off in between each one. Make your workouts as efficient for muscle building as possible by following a high-volume training program. According to strength and conditioning professional Dr. Lee E. Brown, a volume most effective for building muscle includes three to five sets of eight to 20 repetitions of each exercise. For each set of biceps and triceps exercise to contribute to muscle overloading, select a weight that causes your muscles to fatigue after they've completed at least eight reps, but before they've reached 20. There are exercises that effectively isolate the biceps and triceps. For the biceps, you could select from barbell or dumbbell biceps curls, hammer curls, incline curls or isolation curls. Work your triceps with lying triceps extension, overhead triceps extension, kickbacks and triceps pushdown. However, consider also incorporating compound exercises into your workouts. Compound exercises involve movement at multiple joints, so not just your elbows. Examples include close-grip pushups, which involve movement at both the elbows and shoulders and thus in addition to the triceps, work your chest and shoulders. The chin-up is a compound exercise that require the shoulders and elbows to get involved and works your biceps and back. According to the American Council on Exercise, compound exercises are more effective at building muscle mass. When you're training for strength, you want your muscles to be fully recovered in between sets so that they can lift the heavy weights. But, when training to increase the size of your arm muscles, keep the time in between sets to just 30 to 90 seconds. A short rest period stimulates the release of muscle-building hormones and also makes your workout more effective for overloading your muscles. An option when working the biceps and triceps is to superset your workout. This means you do a set of a biceps exercise and then right into a set of a triceps exercise. You go back and forth between the two exercises until all sets are done, with each set taking about 60 seconds. Working out this way allows you to do more sets in a workout. Does Curling Make Your Forearms and Biceps Bigger? What Are the Causes of Flabby Arms?